Paul Manafort, Trump’s former campaign manager, already convicted on 10 felony counts including financial fraud and conspiracy to obstruct justice, was facing a second trial on different counts that might land him in prison for life. He was hoping to gain a lighter sentence by co-operating with Robert Mueller but is now accused of breaching his plea agreement and that he “committed federal crimes by lying to the Federal Bureau of Investigation and the Special Counsel’s Office on a variety of subject matters.“ More on Manafort’s unsavoury past in the URL below. Trump has hinted he may pardon him. 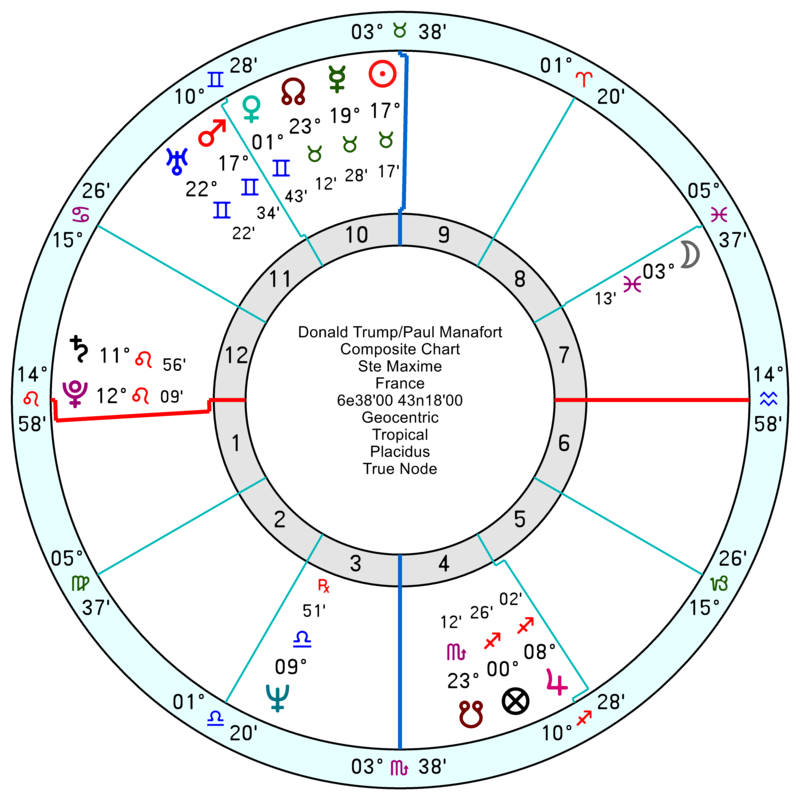 Born 1 April 1949 in Connecticut, Manafort is a go-getting Sun Mars Venus in Aries opposition Neptune and trine Pluto – not short of ambition, the art of smokescreening or determination. 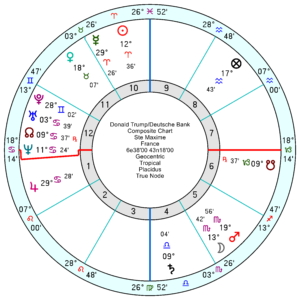 His stars are mixed with tr Saturn square his Aries planets and Neptune in December/January 2019; though he also has some relief from tr Uranus square his Jupiter through December to early February 2019. Further ahead and over 2020/21 he looks crushed. 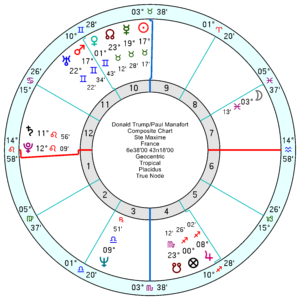 His relationship with Trump is panicked in the middle week of this December and is on a fast downhill slide from April 2019 onwards as tr Neptune opposes the composite Mars, then Mars/Uranus, then Uranus into the early 2020s. 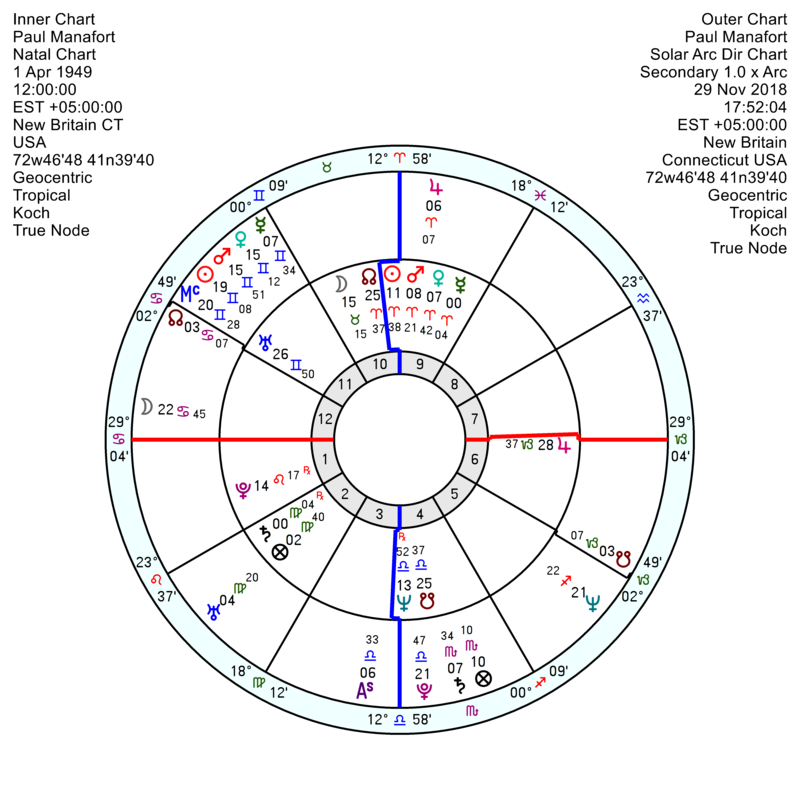 Though there are hints Manafort may rise again as his Solar Arc Jupiter is conjunct his Mars and then Sun into the early 2020s. Trump’s former lawyer, Michael Cohen, 25 August 1966, has pleaded guilty to lying to Congress in relation to the Russia inquiry, misleading lawmakers about talks over a Trump property deal in Moscow during the presidential race. Trump said he was “lying” to seek a reduced sentence. 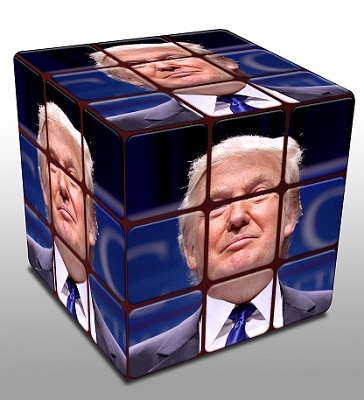 In August, Cohen pleaded guilty to violating finance laws during the 2016 presidential election by handling hush money for Mr Trump’s alleged lovers. Cohen looks discouraged over the next three months, suffering a shock in March and generally feeling dis-empowered and overwrought through 2019/2020 though he may pick up a head of steam again from 2020. 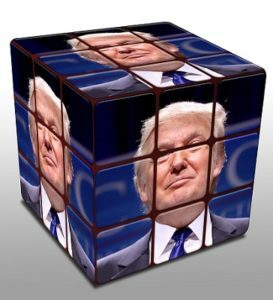 His relationship with Trump looks jangled till February and more disrupted come May 2019. Deutsche Bank has two dates – 22 January 1870 and 10 March 1870. 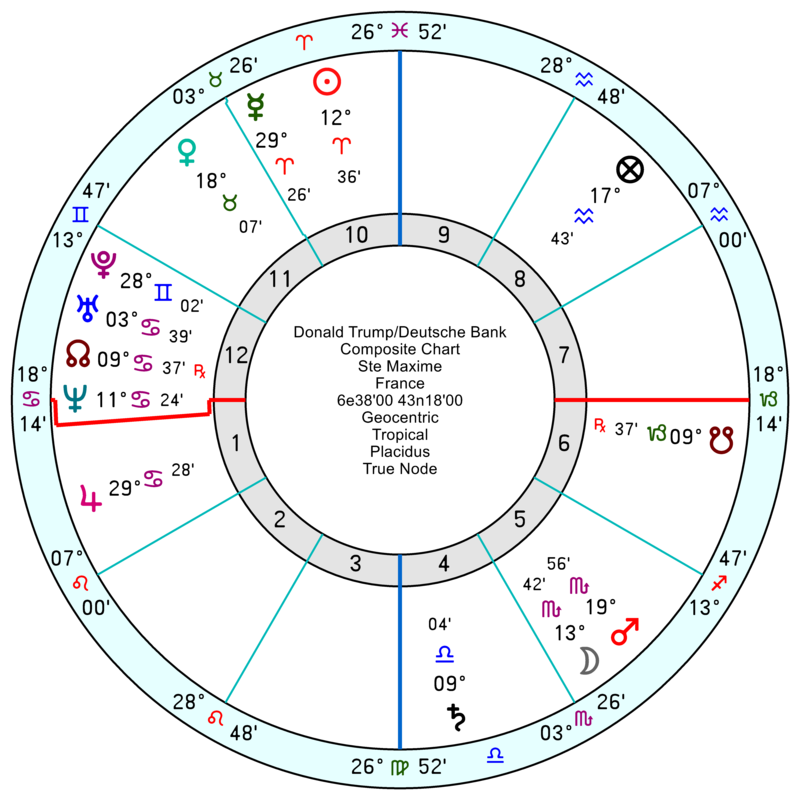 The relationship charts with Trump on both of these highlight upsets through this December to mid February 2019; with major anxiety in the days surrounding this New Year. Trump’s personal chart is slipping and sliding through till the New Year with his confidence undermined. But where he plunges into a variety of sinkholes will be from mid February 2019 onwards for two years, which he’ll no doubt respond to with his usual bullish bravado but it won’t last. See post Trump Timeline August 22 2018.
or he dies. 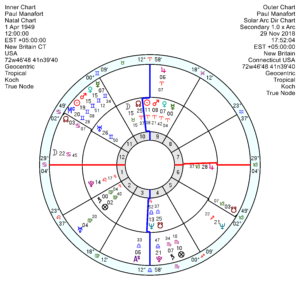 When my sister died of cancer, she had a lot of Jupiter transits going on at the time. Manafort is not in good health and may welcome death in 2020 rather than spend the rest of his days in prison. Could his comeback in 2020 be that he comes clean about Trump and gets a lenient sentence in state courts for his crimes as a result? And to think that we still haven’t heard anything from Gen. Flynn! His plead quilty one year ago tomorrow, and the trial was intially due in mid-September. He either has very damning information, or Cohen has very solid evidence, and Mueller opts to pursue this line rather than line with Flynn, which might require burning some Intel sources. I tend to go with latter, although Flynn might be vital in indicting VP Pence. real estate deals and shady campaign funds :I don’t see the big deal about this Russia trivia. Well, some of us don’t want to be living in a Russian style cleptocracy without Rule of Law, either. If you are not there already, I suggest you try it in Russia (which, by the way has a larger Muslim population than ANY Western European country, as well as a couple of millions illegal immigrants from Central Asia). Red China has implemented gulag-style indoctrination camps for the central asia muslims. Has any country tried Western-style democracy? Me too. It was a fascist coup and it scares me to no end here in my country. Thanks for the inside track on Trump and fellow outlaws. Very enlightening and a wee bit discouraging here and there. The thought of Manafort making any kind of comeback makes me wanna gag.